Gold bullion comes in a variety of standard sizes, but as time has passed what is considered to be “standard” has changed. The reason for this is because the price of gold is also always changing and what once used to be a small, inexpensive investment in metals may now cost you more than you would have ever expected. The purpose of this article is to explain what other sizes of gold bars you may come across when looking to invest and any pertinent information you may need to know about them. There are so many different companies producing bullion that even with bars that look very similar there can be major differences. While these differences may not do much to the price or value of the gold at hand, they are good to know as an investor. In the following few sections you will be briefed on just about everything there is to know about other sizes of gold bars that you may have never thought existed before. When talking about gold bars that may be different than you typical one gram and one ounce bars, it may sound like I am talking about hard to find, never before seen bars. 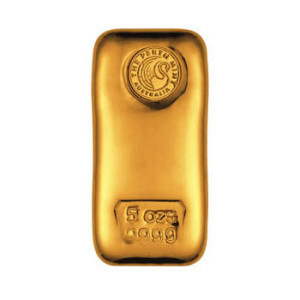 The reality is that a variety of gold bullion that often goes overlooked is the 5 ounce gold bar. This bar constitutes a more substantial investment than a single ounce without forcing you to commit yourself to an investment as large as 10 ounces. This 5 ounce difference in either direction may not seem like a big deal, but that fact of the matter is that a 5 ounce difference can mean the difference between saving or spending a couple thousand extra dollars. Investors are not known as people who was their money so there is no reason why one should be forced to buy 5 one ounce bars or simply bite the bullet and pay for a more common ten ounce bar. A lot of investors either undersell or oversell the amount of money they want to spend on an investment because they are simply unaware of the existence of a medium ranged bar. Also, if an investor who is unaware of 5 ounce gold bars would like to make a purchase of 5 ounces of gold, in his mind he is going to have to purchase 5, individual ounce bars. If that same investor were to know of the existence of a 5 ounce gold bar he could make the investment he wants while only purchasing one single bar. When searching for 5 ounce gold bars online, the two main producers you will come across are Johnson Matthey and Pamp Suisse; two very respected companies when it comes to the production of precious metals. 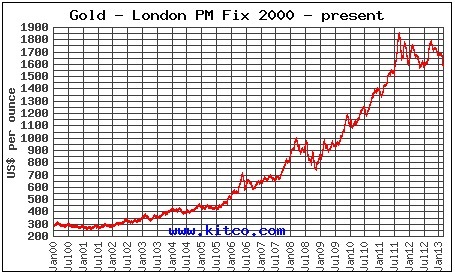 Gold bars and rounds are two of the most widely used vehicles for investing in the yellow metal. Little known to most is that there are other types of bullion that may be just as good for investing that do not come in the form of a round or bar. Gold pendants are another type of bullion which is made entirely of gold and can even be used as a charm on a necklace or simply in the same fashion as a gold bar or round; strictly for investing. Pendants differ from gold bars in that they usually have an image depicted on them, such as a flower or a Greek god. This added feature attracts an entirely different crowd than the one that comes searching for plain bars and rounds. Pendants are for those people who want to show off their gold more than have it sit in a dresser drawer and accrue interest. The only downside to pendants is that if they are attached to a necklace or something similar, you are running a risk of tarnishing or chipping the gold. Because gold is such a soft metal, the use of it day in and day out means that you are taking on an extraordinarily high risk of having your pendant lose value. So long as you treat your pendant with expert care, the wear and tear factor will not matter nearly as much as you might think. This means that you should avoid daily use of the pendant as well as use of the gold pendant in precarious situations where it even has the smallest chance of being harmed. With things like 5 ounce bars and gold pendants, figuring out the premium over the spot value of the metal is not so easy because not as many sites carry these products as they do 1 ounce or gram gold bars. A premium, for those who do not know, is what an online or brick and mortar dealer of precious metals charges over and above the actual value of the metal in order to cover the costs of them running a business and hopefully turn a profit. Premiums may seem unfair or unneeded, but without them it would be nearly impossible for a precious metal dealer of any size to stay in business for very long. Because gold pendants can come in just about any size and depict a variety of different images on them, their value is more or less judged by the company that made it and the image depicted on the pendant. Determining a fair premium over spot is not easy, but the best way to do so would be to find a gold bar of comparable size and see how much the premium is on that item. If your pendant falls within a close range of the comparably sized bar you can then be rest assured that you are not being taken advantage of. This may not be the easiest way to determine how much you should be paying for a gold pendant, but it is the best way to ensure that you are getting a deal. 5 ounce bars, on the other hand, have premiums that are much easier to find out and understand. More often than not you can expect 5 ounce bars to have premiums that do not exceed $50. If you do find a 5 ounce gold bar and the premium exceeds this $50 mark you should do a little shopping around because you may be able to get a better deal elsewhere.